This posting is about arthrousness in proper names, specifically the choice between anarthrous Batman and arthrous the Batman in the 2012 movie The Dark Knight Rises, which I viewed on tv last month. But first I need to give some background about the movie. The Dark Knight Rises is a 2012 British-American epic superhero film directed by Christopher Nolan, who co-wrote the screenplay with his brother Jonathan Nolan, and the story with David S. Goyer. 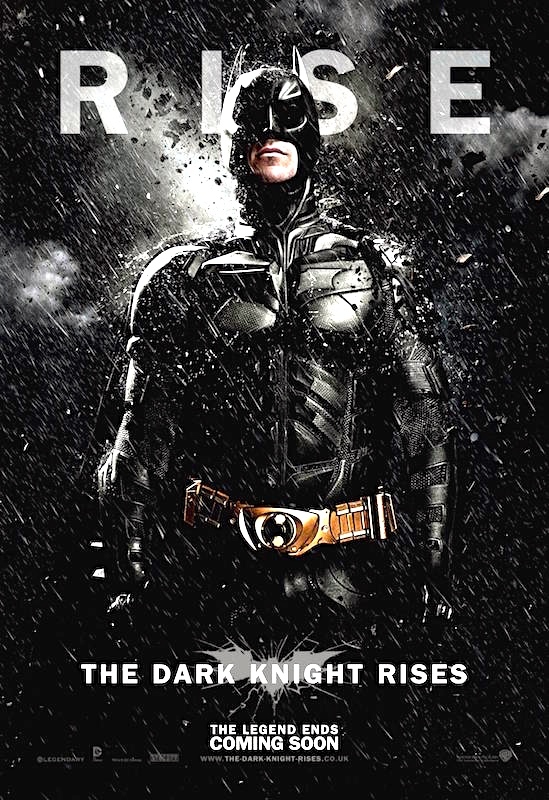 Featuring the DC Comics character Batman, the film is the final installment in Nolan’s Batman film trilogy, and the sequel to Batman Begins (2005) and The Dark Knight (2008). Christian Bale reprises the lead role of Bruce Wayne/Batman, with a returning cast of allies: Michael Caine as Alfred Pennyworth [Bruce Wayne’s butler and confidant], Gary Oldman as James Gordon [Commissioner of Police in Gotham City], and Morgan Freeman as Lucius Fox [CEO of Wayne Enterprises and designer of high-tech equipment]. The film introduces Selina Kyle (Anne Hathaway), a sly, morally ambiguous cat burglar, and Bane (Tom Hardy), a revolutionary bent on destroying Gotham City who forces an older Bruce Wayne to come out of retirement and become Batman again. … [also a new character, created for this film] John Blake (Joseph Gordon-Levitt), a once-orphaned patrol officer who has deduced Batman’s true identity from their similar backgrounds. Gordon promotes Blake to detective, with Blake reporting directly to him. What I noticed in watching the movie was that while almost all the characters referred to the Dark Knight anarthrously, as Batman, two characters, Gordon and Blake, almost always refer to him arthrously, as the Batman. (1) [Alfred to Bruce Wayne] Do you remember when you left Gotham? Before all this, before Batman? (2) [Alfred to Bruce Wayne] You see only one end to your journey. Leaving is all I have to make you understand, you’re not Batman anymore. (3) [John Blake to Bruce Wayne] I don’t know why you took the fall for Dent’s murder, but I’m still a believer in the Batman. Even if you’re not. Gordon: We were in this together, then you were gone. Bruce: The Batman wasn’t needed anymore. We won. Gordon: Based on a lie. And now there’s evil rising from where we tried to bury it. The Batman has to come back. Bruce: What if he doesn’t exist anymore? Blake: … never know who it was that saved an entire city. Gordon: They know. It was the Batman. Batman is a fictional superhero appearing in American comic books published by DC Comics. The character was created by artist Bob Kane and writer Bill Finger, and first appeared in Detective Comics #27 (May 1939). Originally named “the Bat-Man”, the character is also referred to by such epithets as the “Caped Crusader”, the “Dark Knight”, and the “World’s Greatest Detective”. Let’s start with the N + N compound composed of bat and man and used as a common noun — bat man, bat-man, or batman — to refer either to a creature that is both bat and man (a copulative compound) or to a man who is like a bat (a subsective compound with man as head and with a resemblance semantic relationship to the thing denoted by the modifier noun bat). Then: the common NP the batman, with the definite article the, is interpreted as conveying either uniqueness or identifiability or both. That makes it open for conversion to a proper name denoting a particular thing or person, as in the Bat-Man. Similarly for the caped crusader and the dark knight, which can be converted to proper names, epithets for a particular person, say, a character in a comic book. And, for that matter, non-compound common nouns like penguin, joker, and riddler can be converted in similar fashion, giving us names for three villains in Batworld: the Penguin, the Joker, and the Riddler. Meanwhile common nouns on their own (not constituting a full NP) can be used as nicknames — jocular, insulting, affectionate, or merely appropriately descriptive. On the appropriately descriptive side, that gives us names like Mole and Rat (or Ratty) for the mole and rat characters in Kenneth Grahame’s 1908 children’s book The Wind in the Willows and Pig, Rat, Zebra, and Goat for the main characters in the comic strip Pearls Before Swine, who are, respectively, a pig, a rat, a zebra, and a goat (anthropomorphized). And, from common compound nouns, names like Batman (for a particular batman), Catwoman, and Batgirl. (1) When there’s competition between an arthrous and an anarthous version of a name, the anarthrous variants tends to win over time, because it’s shorter. As in the case of (the) Batman. This entry was posted on October 4, 2015 at 5:38 am and is filed under Articles, Movies and tv. You can follow any responses to this entry through the RSS 2.0 feed. You can leave a response, or trackback from your own site. Although the characters in The Wind in the Willows are sometimes referred to with the article as well.